Peanut butter and chocolate have nothing on Capcom’s latest. 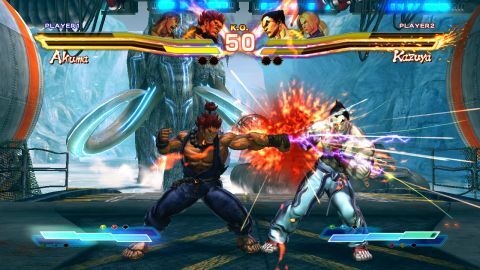 Street Fighter X Tekken is the latest game in Capcom’s 21st-century fighter renaissance, and it looks set to continue the winning streak started by Street Fighter IV. Ever since SFxT’s first announcement we’ve had one burning question: How can Capcom integrate Tekken’s cast of 3D brawlers into the gameplay mechanics of a 2D fighting game? Jamming Tekken’s alien 3D concepts into a 2D Street Fighter game seemed akin to sanding off the corners of a square peg for a round hole. So, how did Capcom fare? Reasonably well. There’s a definite gameplay divide between the two companies’ characters, but that’s not really a bad thing. The Street Fighter characters play similarly to their SF4 counterparts - no surprise there. But in addition to their relative lack of projectiles, the Tekken fighters tend to feature a surplus of short canned attack strings, often a dozen or more. (Those goofy 10-hit strings didn’t make the cut, thankfully.) Oftentimes these strings translate Tekken’s left/right punch/kick inputs directly into Street Fighter’s physically analogous weak and medium punch/kick buttons, but the commands frequently vary from their Tekken originals, so even Tekken pros will have to relearn the ropes, somewhat. Long story shorter, whereas the Street Fighter characters tend to have smaller, more easily understandable move sets, the Tekken fighters have larger arsenals that often blur the line between special moves and normals. As a result, they’re often tougher to pick up and understand at a glance, particularly for those of us without recent Tekken experience. Figuring out how to combine all of these often similar-looking attacks into a cohesive offense is definitely a learning process that will benefit from practice, shared community knowledge, and FAQs. Once past the initial hump, SFxT plays like some frenzied midpoint between SF4 and Marvel vs. Capcom. Expect lots of chain combos into launchers, moves that bounce opponents off walls, and improbably long juggles involving multiple character switches. It’s a mistake to play SFxT like SF4, which even the briefest, likely painful online dalliance will quickly make clear. Instead, you’ll need to become extremely comfortable with the tag dynamic, and consider how your character choices impact tag combo possibilities. We definitely experienced an adjustment period - we weren’t able to do particularly well with our long-planned wrasslin’ team of Zangief and Hugo despite knowing how to play them each individually. SFxT is a team game, and wise leverage of tagging is a must. The character selection offers an excellent cross-section from both Street Fighter and Tekken, weighing in at 38 faces on 360 and 43 on PS3, with forthcoming DLC to add another 12. (That will bring the PS3 version just one shy of 56-character-strong record-holder MvC2, which has held that crown for over a decade). Amusingly (or not) hacker types recently discovered that the 12 future DLC characters are already on the disc. Oh, Capcom. Before the DLC brouhaha popped up, the single most controversial aspect of SFxT was the new gem system, which lets you equip your characters with stat- or ability-boosting gems that activate under certain circumstances. For example, one gem gives you 20 seconds of +20% extra defense (and -10% attack power) after being hit by three special moves; the effect can only fire once per round. While extra gems are available via preorders and in-game purchases - which is where many people start having a problem with it - the default gems don’t seem to have an untowardly large effect on balance. While forthcoming gem releases may change this, as of now gems just add a little more flavor. We doubt Capcom will do much to upset this careful balance. Description Two of the biggest fighting universes colide in this upcoming brawler.